4 Major Causes of Squeaky Floor! Wood flooring gives a classic look to your home and adds charm to it. But they can be annoying sometimes, as they produce a squeaky or creaky noise. Squeaky floors are a pain, if you are trying not to disturb anyone in your home at late night or in early morning. The squeaking floor can be an annoyance and can interrupt your peace. Squeaking or creaking of floors can happen in wood flooring, laminate flooring and even in carpet flooring, if the subflooring is made with plywood or natural wood. Almost every homeowner, who has wood flooring or subfloor made up of wood, experiences the problem of squeaky floor at some point. It is important to investigate the causes of squeaky floor, before you make the decision to fix it. Here we have given brief information on causes of squeaky floor, which will help homeowners in fixing this problem. Natural wood is susceptible to environmental conditions. It will expand in humid atmosphere and contract in cooler winter season. In winter season, wood floorboards shrink, and a thin gap develops between them. When walked upon, the floorboards rub against each other and produce squeaky sound. In monsoon or humid climate, the wood flooring will expand and hence, the floorboards will rub against each other to produce squeaky noise. Due to sudden temperature/humidity changes, expansion and contraction of flooring occurs and the bond between subfloor and flooring becomes weak. If your flooring is glued it will become loose, and if it is nailed down then, the nails become loose. This will cause flooring to rub against subfloor and produce squeaky or creaking noises. Solid wood flooring will be more affected by temperature and humidity changes as compared to engineered wood flooring and laminate wood flooring. Engineered wood flooring and laminate wood flooring have certain resistance towards temperature and humidity changes. However, they also expand and contract up to some extent and create squeaky floor. Sometimes, the squeaky sound is coming from the subfloor instead of the flooring. This is a common problem in houses which have carpet flooring levelled on plywood subfloor. While building subfloor, the floor joists must be levelled and flat so that a levelled subfloor can be laid. If subfloor is uneven, then the plywood sheeting will move up and down upon walking. Over time, the unlevelled part of the floor will go down and hence a gap between the adjacent floorboards develops. Due to the gap the nails holding the floor will become loose. Thus every time you walk from that particular floorboard, you will hear squeaky sound due to rubbing of flooring and nails. The nails can also become loose due to cracked or damaged floor joists, which ultimately leads to squeaky floor. Also Read: Wood Flooring Types You Need to Know! Poor workmanship while installing wood floors can also lead to squeaky floors. The flooring is generally secured down with nails or glue. Sometimes, workmen may not put the floorboards immediately on the freshly laid glue and delay in placing of the flooring. The glue begins to set. Fixing flooring on already set glue will lead to improper installation, which may account for creaking noises coming from the floors. Another practice of installing wood flooring is to fix it using nails. For faster installation, many carpenters use nail guns to fix it. Sometimes in hurry, the nails do no penetrate enough and hence, improper installation is done. The same is applied to subfloor; if subfloor is also not installed properly, it may lead to squeaky floor. The flooring must be installed according to the manufacturers’ instructions. Sometimes failing to follow these instructions can lead to squeaky floor. Manufacturers recommend acclimation of the wood planks before fixing it. Acclimation is the process through which wood planks adjust to the environmental conditions. Before installation the wood flooring planks must be kept in the room for 5-7 days so that they expand and contract accordingly. If acclimation is not done, the planks will develop gaps after installation, which also leads to squeaky floor. Proper expansion gaps must be provided to account for expansion in humid atmosphere. 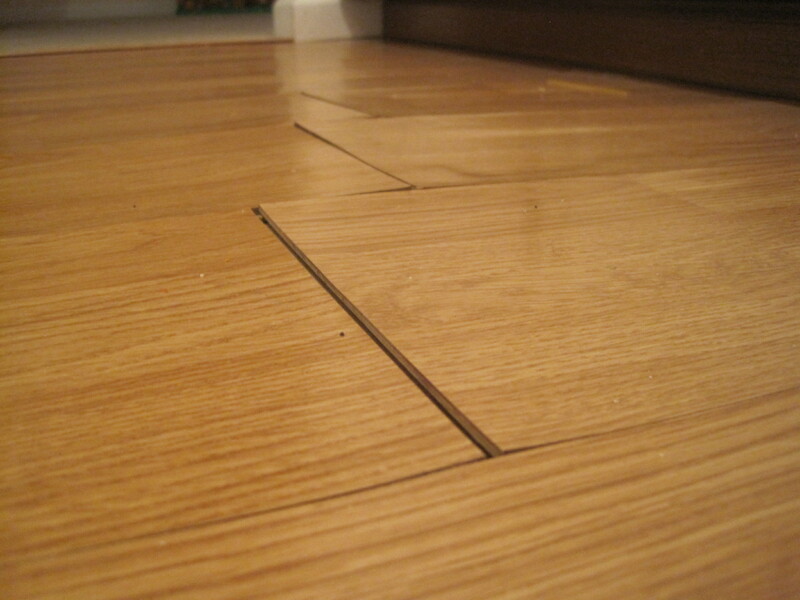 If gaps are not provided, the floorboards will swell and rub with each other, which also leads to a creaky floor. Also Read: Expansion Joints in Tiles: Reasons & Consequences! Foundation of the house experience settlement and movement due to expansive soil or other soil related issues. When there is movement in foundation, there may be stresses on the sub flooring and floor joists. Hence due to damage in floor joists, the floor may start creaking, as sections of flooring rub together or the nails becoming loose. If there is a significant differential settlement, there are more chances of damage to subfloor, which may be the cause of squeaky floor. The aforementioned causes are common causes of a squeaky floor, which are usually found. However, it is recommended to seek the advice of a professional and qualified wood floor fitter to know the exact cause of squeaky floor. With the help of a certified flooring contractor the problem of squeaky floor can be fixed. Squeaky floor cannot be prevented entirely, but there are few ways to reduce it. The humidity in the house should be maintained consistently to reduce the impact of seasonal changes. Before installing the flooring, it is advisable to follow manufacturers’ instructions to reduce the problem of squeaky floor.